Receive your annual flu jab from our team. 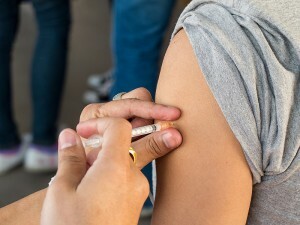 The influenza vaccine is free if you are over 65 years old. Our pharmacists are authorised to vaccinate adults for influenza, the whooping cough, diphtheria and tetanus. We also offer the triple vaccine as well as the shingles vaccine for over 50 year olds. This is advised for all adults. The higher the percentage of our population that is vaccinated, the less likely it is that the population will experience an influenza epidemic. Every year people die from the complications of an influenza virus infection. Immunisation speeds up the time it takes for your body to mount an immune response to the flu virus. If you have the flu vaccination it is likely that when you are exposed to the flu virus your body will either stop the virus in its tracks or that your infection will be less severe than it would have been without the vaccination. Adults who have a pre-existing chronic condition such as respiratory disease, heart disease, diabetes or cancer may be eligible for a free vaccine from their GP and we will advise you if that is the case. During the winter months if you are over 65years old then we can provide you with a free Flu Vaccination. We can also come to your work place with the agreement of your employer and administer your flu vaccination. Contact us today if you are interested in this service. Varicella Zoster is the virus that causes chicken pox. If you have had chicken pox as a child then you are likely to have some natural immunity to the virus, however, some of the active virus is likely to be still in your body hiding away in your nerve fibres and kept under control by your healthy immune system. As you get older your natural immunity reduces and it is common for older adults particularly over 50 year olds to have outbreaks of the Varicella Zoster (chicken pox) virus in their nerve fibres causing the adult condition we call shingles. This can be particularly troublesome if the shingles affects the eye or facial nerves and for some people this extremely uncomfortable condition can go on for months or even years.